Use the USB Charger Doctor to measure the voltage and current output for any USB port and project. This black plastic dongle plugs between a USB device, and passes the data lines through. There's a 0.05 ohm resistor in line with the power pin that is used to measure current draw. 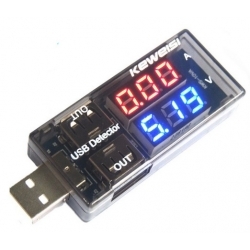 The Doctor's digital display shows both the USB Voltage and the current draw at the same time. You can use this device from 3.5-7VDC input voltage (although most USB devices tend to hover around 4.75 to 5.25) and up to 3A of current. It's a very handy tool for testing USB devices, checking load levels and debugging battery chargers and boost converters.